The painting Surrender of Lord Cornwallis by John Trumbull is on display in the Rotunda of the US Capitol. The subject of this painting is the surrender of the British army at Yorktown, Virginia, in 1781, which ended the last major campaign of the Revolutionary War. The blue sky filled with dark clouds and the broken cannon suggest the battles that led to this event. In early September, entrenched with a force of 7,000 men, Cornwallis had hoped for rescue from the sea, but the British vessels were repelled by a French fleet. Within weeks General Washington had deployed a much larger army, and his artillery bombarded the British positions in early October. 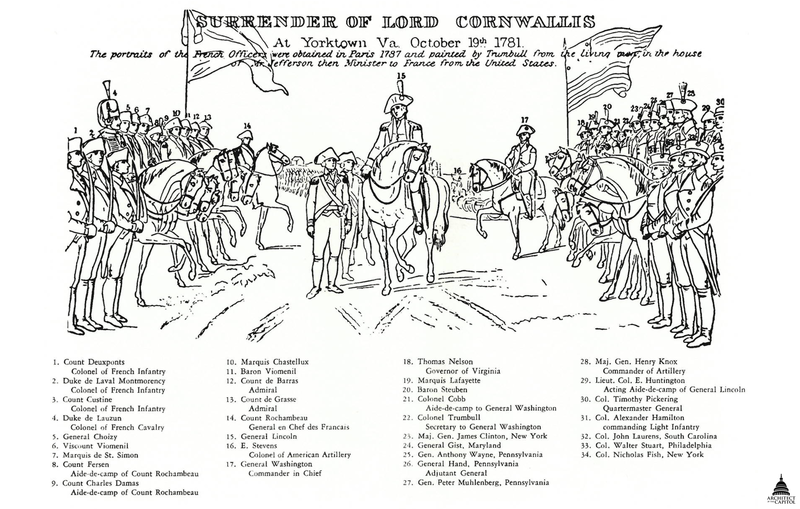 After American and French troops overran two British strongholds, Cornwallis surrendered on October 19. In the center of the scene, American General Benjamin Lincoln appears mounted on a white horse. He extends his right hand toward the sword carried by the surrendering British officer, who heads the long line of troops that extends into the background. To the left, French officers appear standing and mounted beneath the white banner of the royal Bourbon family. On the right are American officers beneath the Stars and Stripes; among them are the Marquis de Lafayette and Colonel Jonathan Trumbull, the brother of the painter. General George Washington, riding a brown horse, stayed in the background because Lord Cornwallis himself was not present for the surrender. Surrender of Lord Cornwallis in the Capitol Rotunda is one of two paintings that artist John Trumbull completed on this subject. He painted this version between 1819 and 1820, basing it upon a small painting (approximately 20 inches by 30 inches) that he had first envisioned in 1785, when he began to “meditate seriously the subjects of national history, of events of the Revolution.” In 1787 he made preliminary drawings for the small painting. Although he struggled for a time with the arrangement of the figures, he had settled upon a composition by 1788. To create portraits from life of the people depicted in this and other paintings, Trumbull traveled extensively. He obtained sittings with numerous individuals in Paris (including French officers at Thomas Jefferson’s house) and in New York. In 1791 he was at Yorktown and sketched the site of the British surrender. He continued to work on the small painting during the following years but did not complete it; nevertheless, in January 1817 he showed it and other works in Washington, D.C., and was given a commission to create four monumental history paintings for the Capitol. Surrender of Lord Cornwallis was the second of these large paintings that he completed. He exhibited it in New York City, Boston, and Baltimore before delivering it to the United States Capitol in late 1820. He completed the small painting around 1828; it is now part of the collection of the Yale University Art Gallery. Trumbull performed the first cleaning and restoration of his Rotunda paintings in 1828, applying wax to their backs to protect them from dampness and cleaning and re-varnishing their surfaces. Throughout the 19th and 20th centuries the painting was cleaned, restored, varnished, and relined. In 1971, damage from a penny that was thrown hard enough to pierce the canvas was repaired. All of the Rotunda paintings were most recently cleaned in 2008.